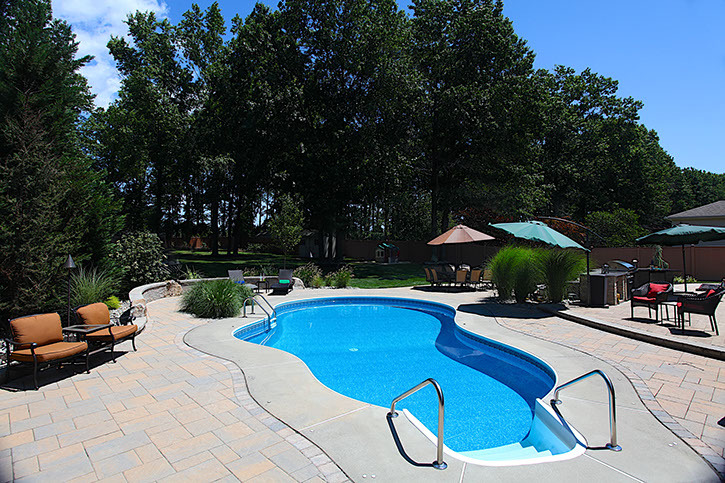 This South Brunswick, NJ freeform pool really transformed with the addition of this expansive pool deck renovation. 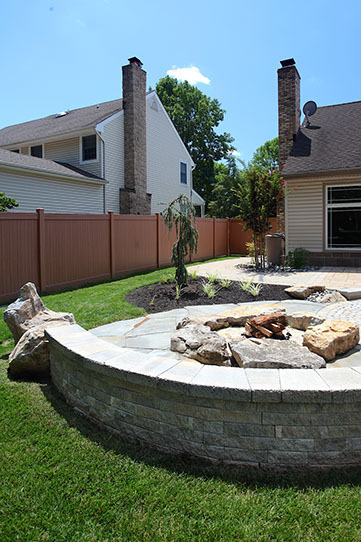 This free flowing patio also got a built in grill cooking station and a fire pit along with some beautiful plantings. 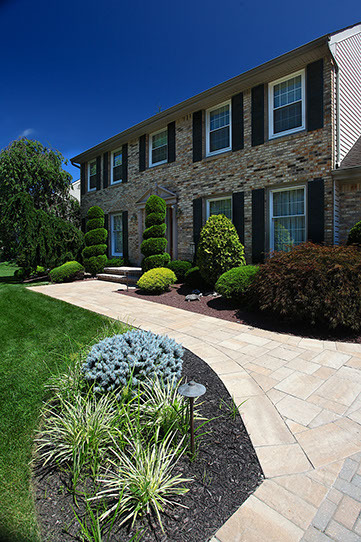 Thats not all though, a new front entrance, and side walkways make this yard beautiful both front and back. 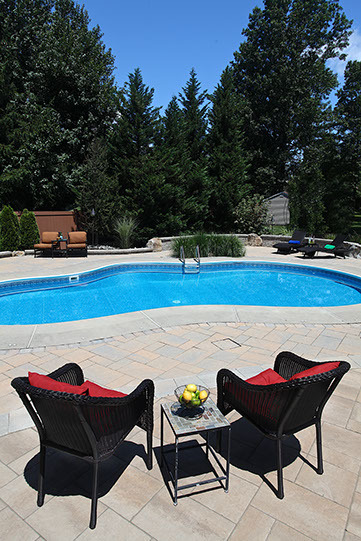 This swimming pool deck has plenty of space for entertaining lots of guests at a party. 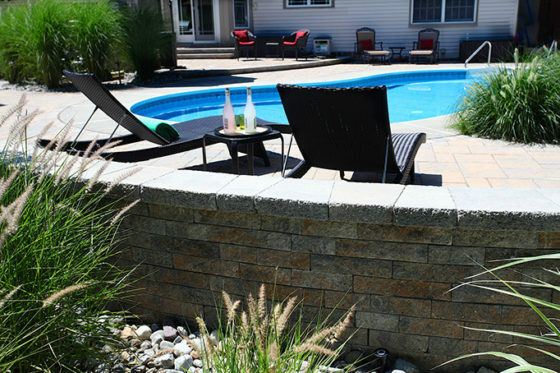 Its design flows around the freeform pool with nice rounded borders. 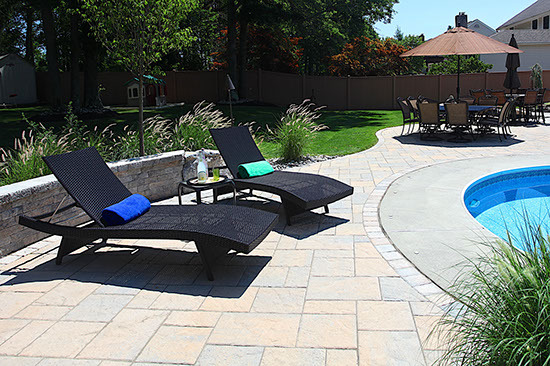 Blended into the design are larger areas for where outside furniture was planned to be put. 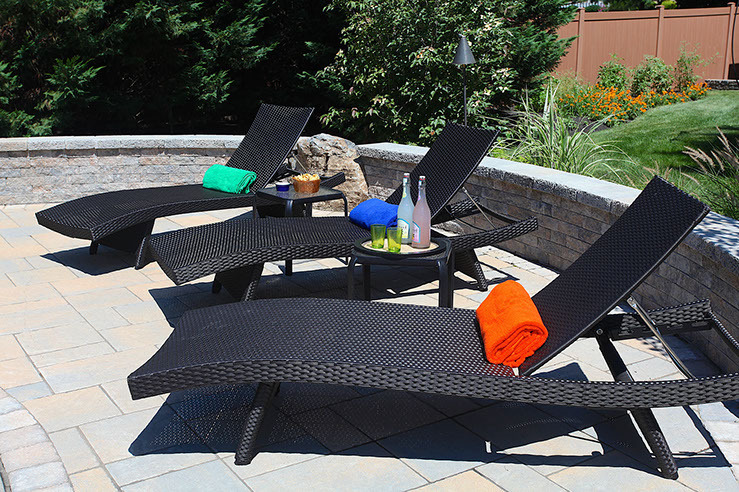 The lounge chairs purposely were placed to maximize sun exposure for sun bathers, or to dry off quickly from the pool. Other areas of the patio wrap around rounded tables with umbrellas so even the furniture seems to fit perfectly in its own space. 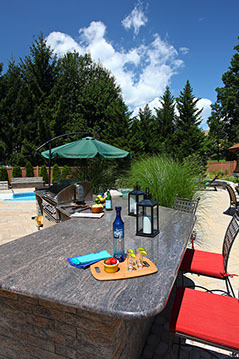 Moving further away from the pool and closer to the house, the patio takes a step up and there is a large dining area and an outdoor cooking station with stools and counters for eating and cooking. 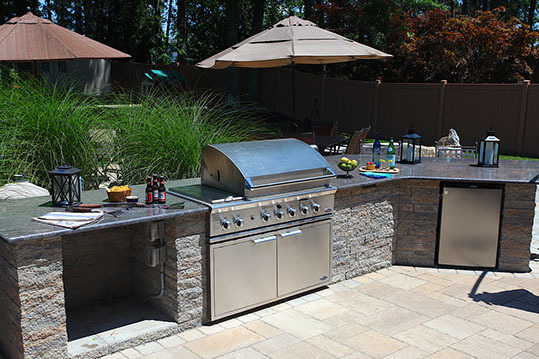 This built in grill serves as an outdoor kitchen. There is a huge amount of granite counter top area for food and prep work. The grill is a top of the line DCS with storage underneath. 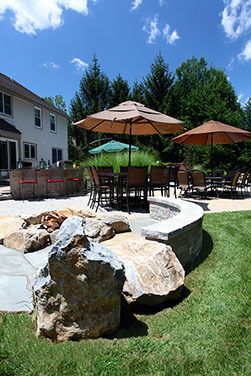 Along the back side of the grill are stools for hungry guests and family members to sit while the chef serves them great food hot off the grill. And if they are thirsty, thats no problem, just grab a cold drink right out of the refrigerator built in right next to the grill. Sitting walls were added along the back edge where the sun bathers lounge near the pool to enclose the space a little bit and to make it feel cozy. 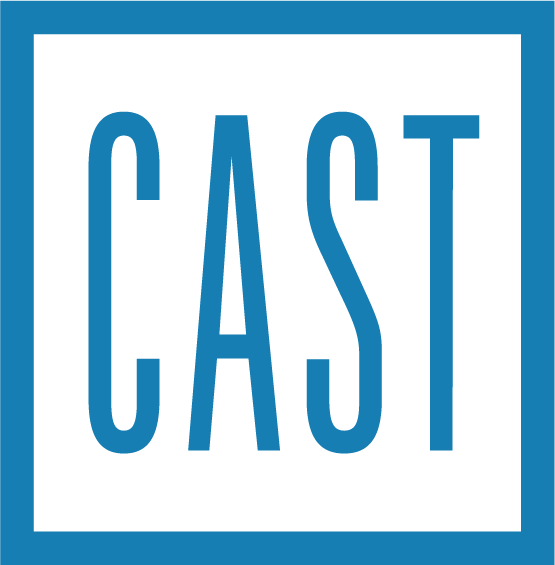 There is also Cast Lighting which lights up the space nicely at night. 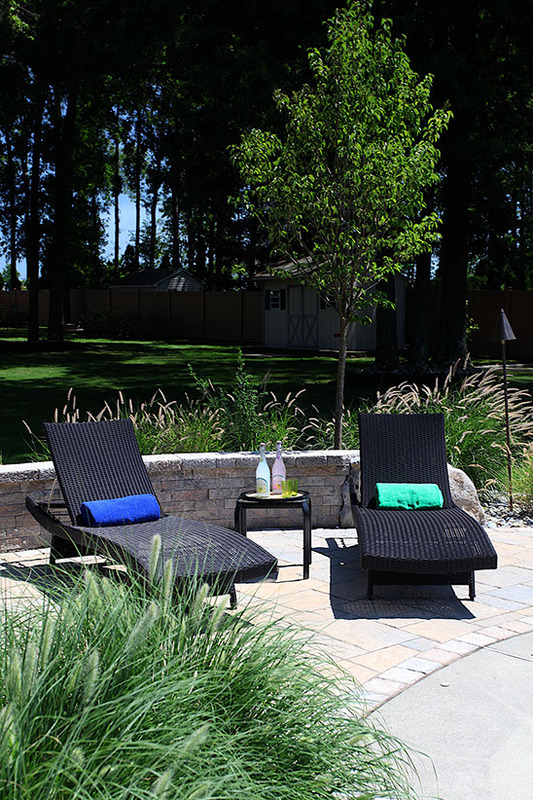 Some natural boulders were added to the walls to create a custom look. 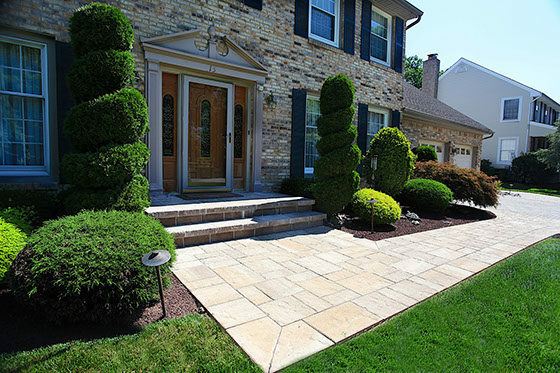 These walls also add lots of extra sitting space for when there are large parties with lots of guests. 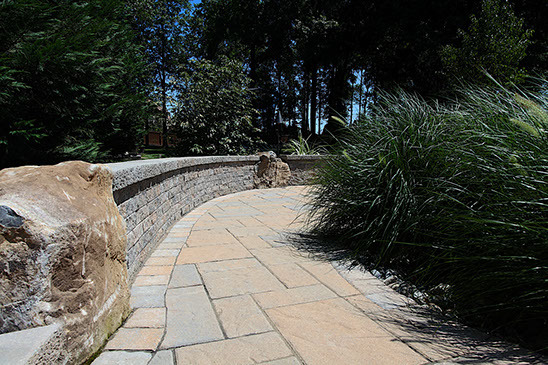 Different plantings of grasses mixed with river jack stone along the walls create a beautiful aesthetic reminiscent of being at a grassy dune along the beach. 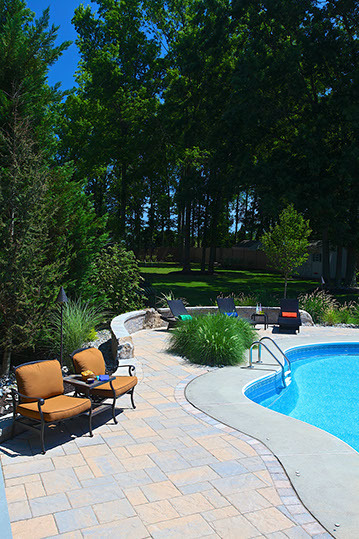 To add to the beauty of the pooldeck out back, a new paver walkway was added around the side of the house. 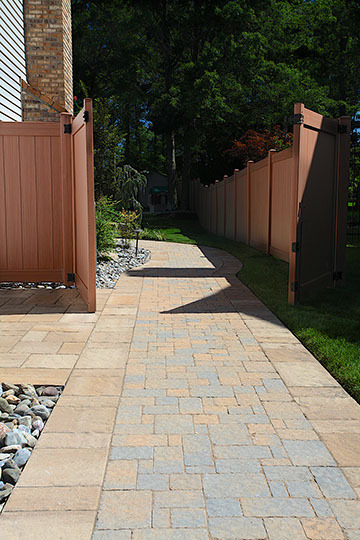 Also a paver walkway was added to the front entrance. Path lighting was added to illuminate the walkways at night. 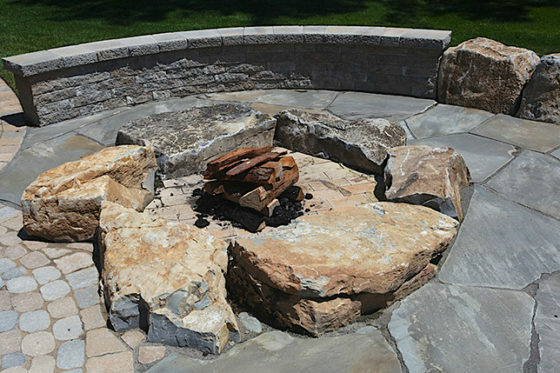 This is a Natural boulder fire pit. 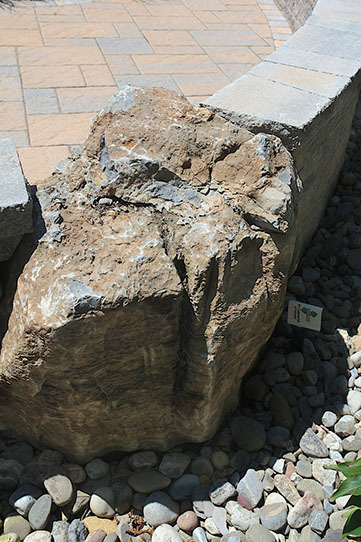 It has split face brick as the base of the pit. 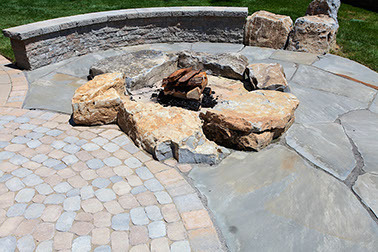 There are Techo-Bloc Antica pavers and natural bluestone surrounding the fire pit to separate the space from the rest of the patio and give it a more custom look. There is a curved sitting wall to huddle up with family and friends with next to the fire pit.